Superconductors.ORG herein reports a new high Tc for Pb-based superconductors. 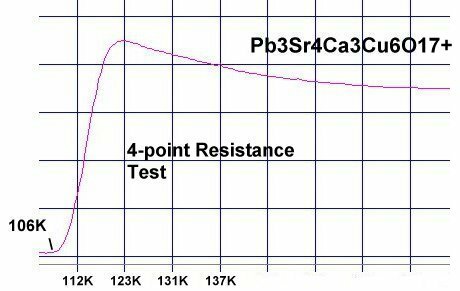 Resistance tests show the intergrowth compound Pb3Sr4Ca3Cu6Ox has a critical transition temperature near 106 Kelvin. Typically, superconducting lead-cuprates do not perform well when the insulating layers contain only Pb. This seems to be related to the velocity of sound through lead. The lattice vibrations that facilitate superconductivity are severely dampened by lead. The best Pb superconductors have a unit cell of around 16 metal layers and at least some planar weight disparity (PWD). The first high-temperature Pb copper-oxide superconductor discovered was Pb2Sr2(Ca,Y)Cu3O8 (by Cava, et al)1. This 70K material has 16 metal layers and PWD between the Y and Ca layers (see far right graphic below). Unfortunately Y and Ca represent only a small fraction of the total molecular weight. So their contribution to promoting Tc is small. In 2005, Superconductors.ORG created a molecule with PWD in the heavier insulating layers to increase Tc to 101K via the new formulation Pb3Sr4Ca2Cu5O15+. 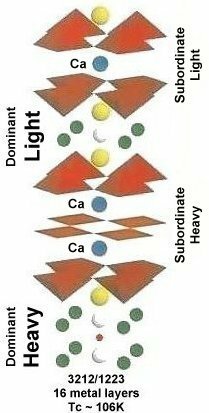 However, that structure only has 14 layers (see middle graphic below). Now, a new 106K derivative goes beyond the 101K material by expanding the lattice from 14 to 16 metal layers per unit cell while retaining the same PWD configuration in the insulating layers. This was accomplished by adding one extra Ca-Cu02 layer per unit cell (see far left graphic above). Normally, applying PWD to both the insulating layers and the Cu02 planes in the same molecule depresses Tc. Thus, adding another Ca-Cu02 layer works against the PWD established by the Pb insulating layers. However, since the Pb layers are significantly heavier than the Ca-Cu02 planes, it was felt that optimizing the unit cell to 16 metal layers would overcome the disadvantages of mixing PWD types. The resulting 106K Tc confimed this hypothesis. This brings to 25 the number of new superconductors discovered since planar weight disparity was found to be a robust Tc enhancement mechanism in February 2005. Synthesis of the material was by the solid state reaction method. Stoichiometric amounts of the below precursors were mixed, pelletized and sintered for 36 hours at 860C. The pellet was then annealed for 10 hours at 500C in flowing O2.